Gems single channel zener barrier. The exceptionally compact design of Gems 65800 series units saves space and simplifies installation; especially in multiples on a common mounting plate. They provide great economy as well since no explosion-proof enclosures are needed for sensor wiring. Encapsulated construction is impervious to dust and moisture. Singlescrew mounting is standard, but units can be supplied with an optional clip for rail mounting. The single through-mounting screw also provides electrical connection to ground through the earth-grounded mounting surface. 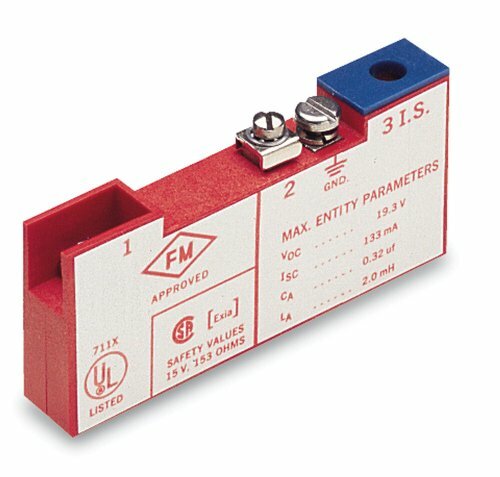 Any non-voltage-producing sensor or switch is rendered intrinsically safe for hazardous locations when properly connected to the output of these zener barriers. Supply zener barrier type. Positive signal polarity. 0.20 Capacitance (micro farads). 3.0 Inductance (milli henry). Protective cover over the output terminal (3) assures intrinsic safety of sensor wiring. Application group: A, B, C, D, E, G. Approvals: UL, FM, CSA. Measures 3-3/16" length by 1-7/16" height.